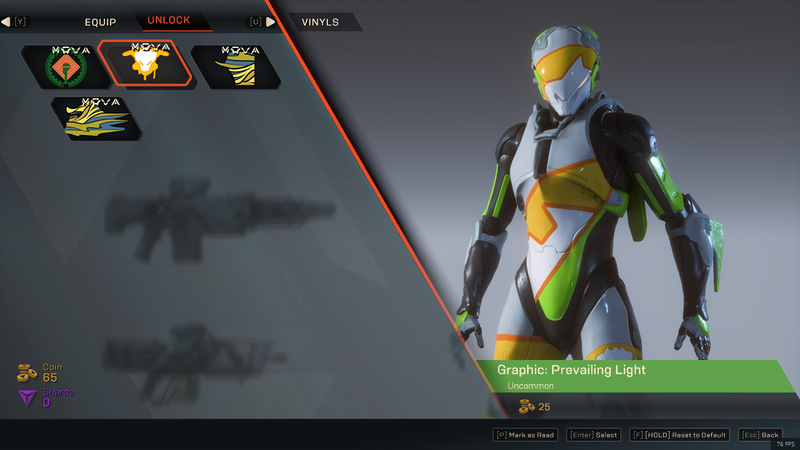 The Anthem Open Demo started on February 1 and will last until February 3. Open Demo as in everyone can play it with no strings attached. Free. 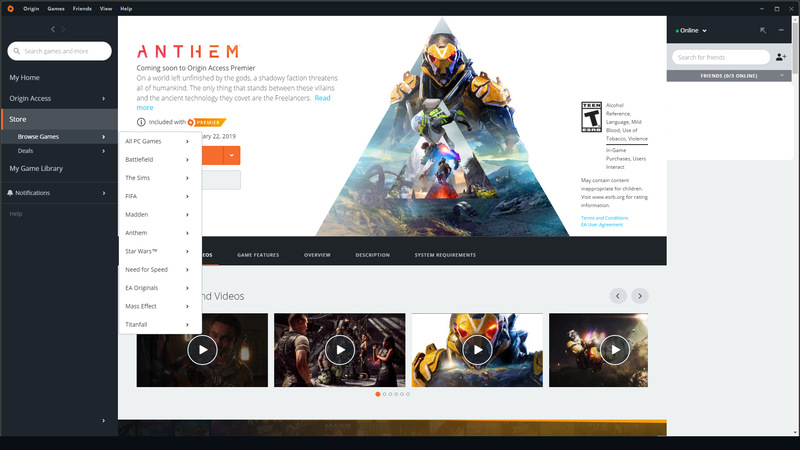 Download the Origin client, then browse games, and pick Anthem. 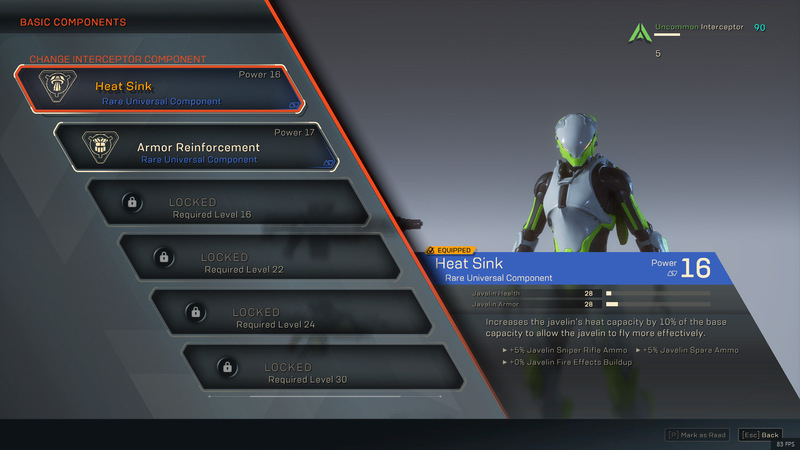 The Anthem page will have a “Try it First” button which downloads the Open demo. Pre-order Anthem (PC/XBox One/PS4) if interested. 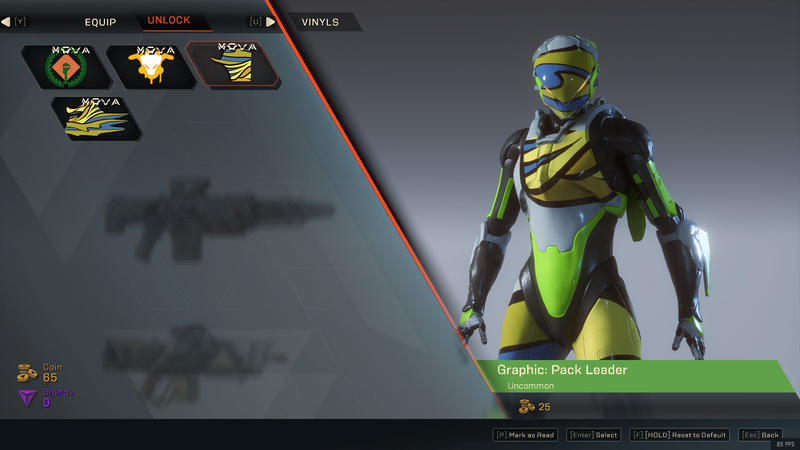 Anthem is by far giving players a lot of javelin customization. You can pick the color from set choices or you can open the color wheel and choose the color and shade (light/dark) of your choice. 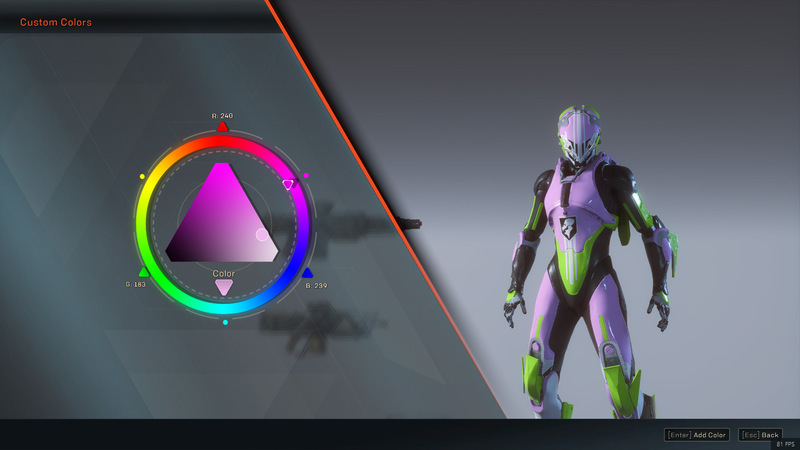 In addition to that, certain areas of the javelin can be customized in terms of paint and materials. On top of that, the demo gives just a taste of “Unlock” parts. You can change the model of: helmet, legs, arms, and chest by purchasing with Coin. While some javelins might look similar, it is improbable for two javelins to look exactly the same. The color gamut alone means multiple possible combinations. 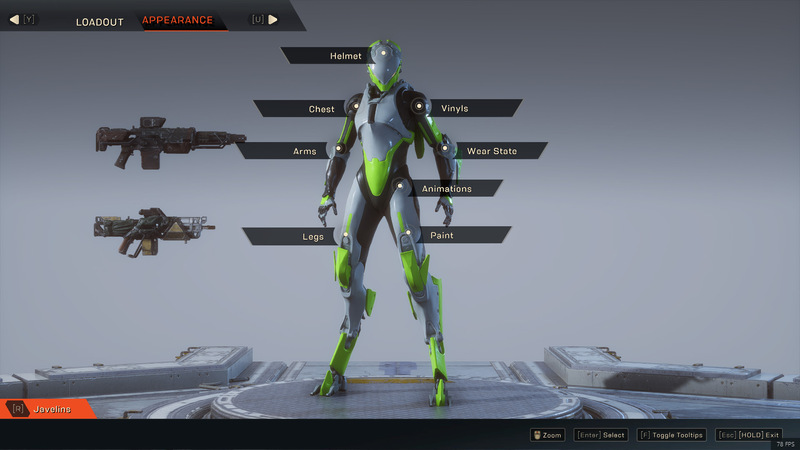 There are four javelin classes: Ranger, Colossus, Storm, and Interceptor. The Ranger is a jack-of-all-trades javelin that generates a static shield (force field) which regenerates when not taking damage. His Ultimate paints multiple enemies onscreen and unleashes micro-missiles at the targets. 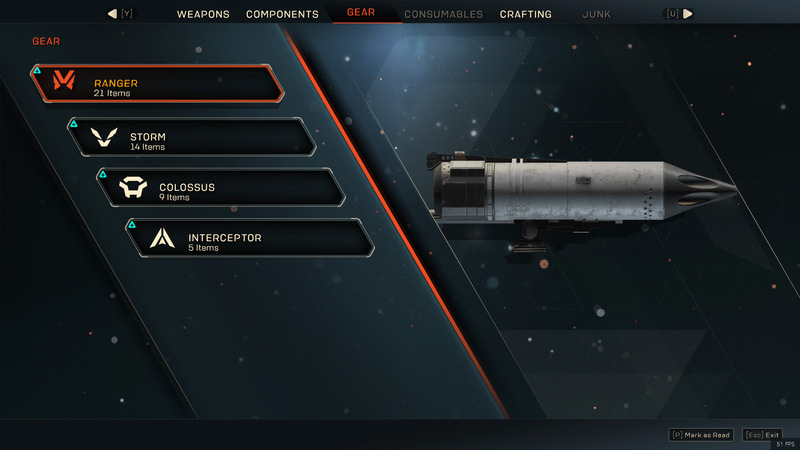 The Colossus is the traditional tank class and can sorta taunt enemies off other teammates. His Ultimate is a Siege Cannon that blasts a large area with devastating results. You can also deploy a manual shield to block incoming attacks. You can also slam the shield at an enemy in melee combat. While the shield is up, the Colossus takes less damage than other javelins, but he is the least agile. The Storm is like an elemental warlock of sorts. This javelin can float in the air longer than any of the other javelins, and gets a bubble shield while hovering. Its Ultimate unleashes an Elemental Storm at the target location, followed by a meteor strike. He can also teleport. This was my favorite. 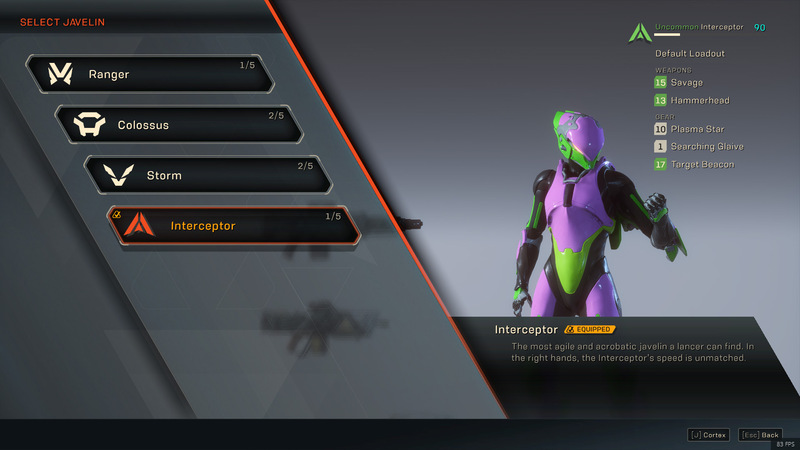 The Interceptor is a ninja and the most agile of the javelins. Able to quickly move away when in low health. Only died once in a stronghold match. Able to kill shielded snipers in close melee combat. Her Ultimate is Assassin’s Blades leaving after-images that continue to do melee damage after the interceptor has moved to the next target. Its spinning barrel in mid-air allows her to evade locked-on projectiles from snipers and else. Its shield regenerates faster than other javelins while moving quickly. I liked playing this javelin too. Lot of survivability through its agility to quickly escape danger and evade incoming attacks from behind while fleeing. 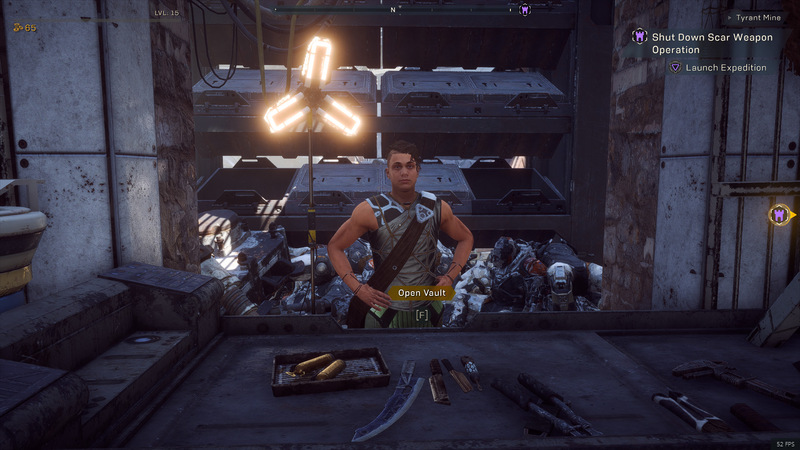 The Forge is located in the right-side, front of the Javelin in Fort Tarsis. 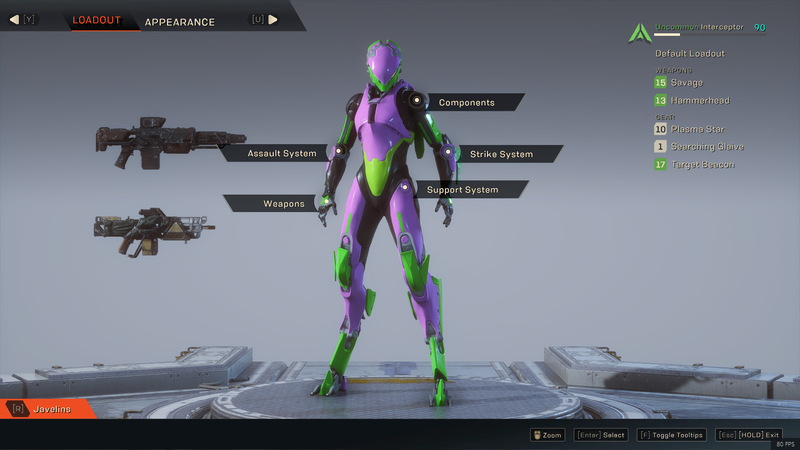 It opens the customization options for each javelin in the Apperance Tab, allows you to switch javelins, and to save Loadouts and rename loadouts for each javelin. 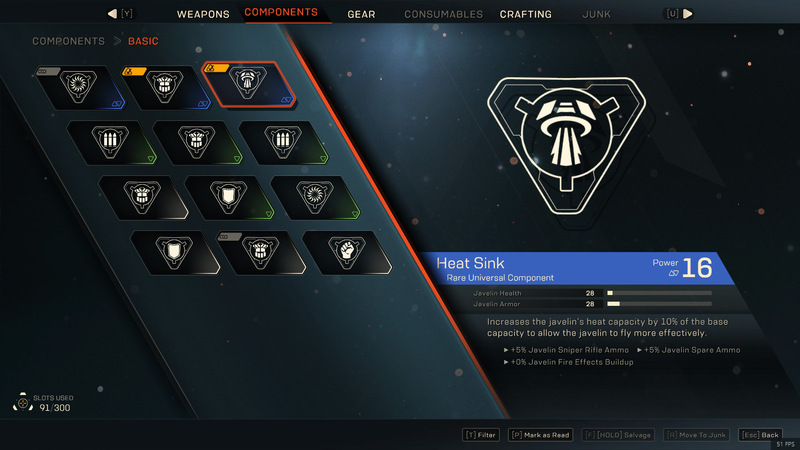 The forge also allows you to change weapons, components, Assault system, Strike System, and Support system of each javelin. These can be modified from items that drop in Expeditions, or from materials by crafting them. 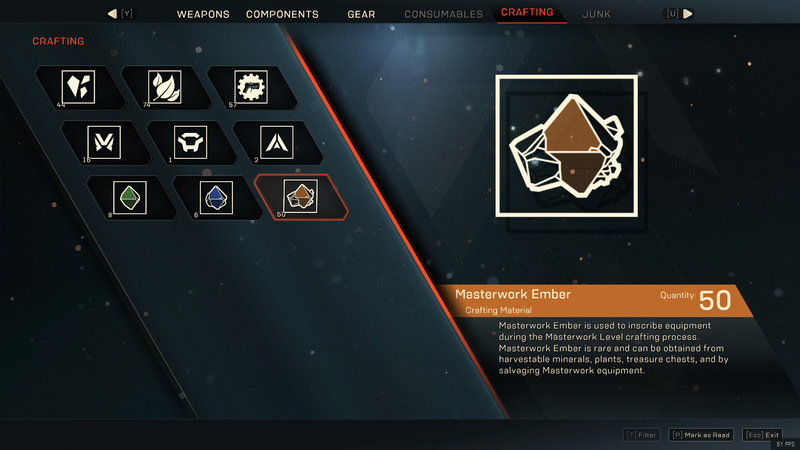 Crafting is disabled in the Open Demo. 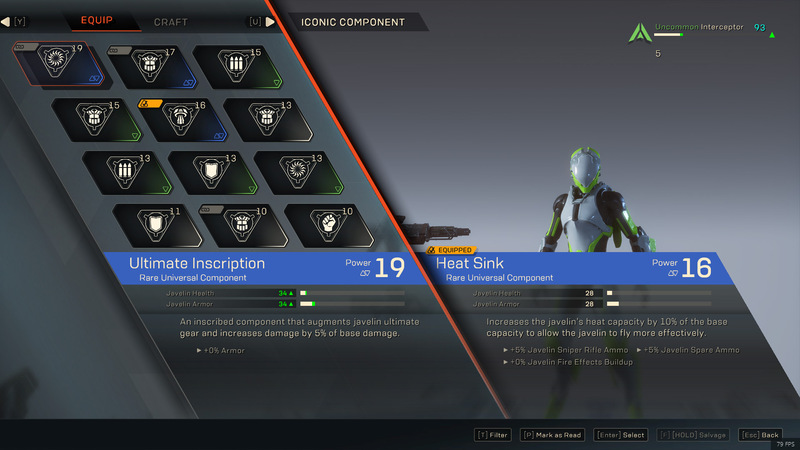 On PC, when the Forge UI is open, press R to open the Javelins menu. Here you can switch Javelins. 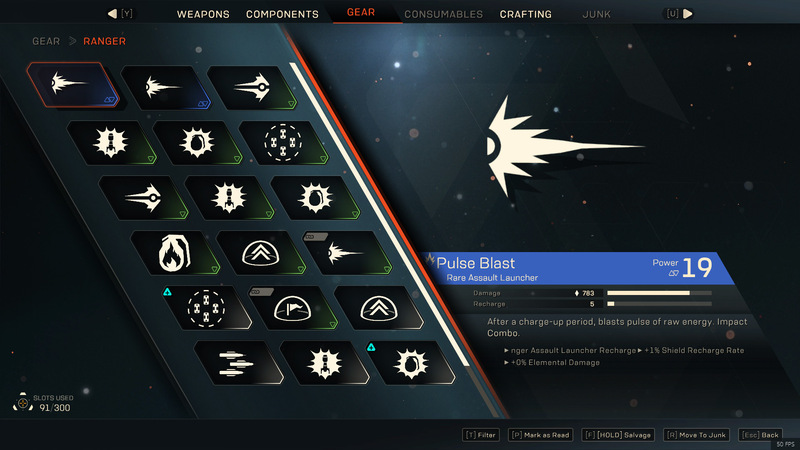 You can create and name up to 5 Loadouts per javelin. 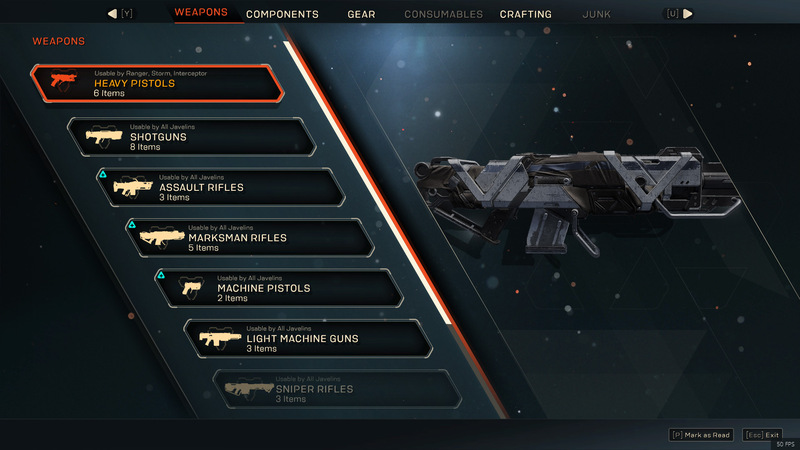 The Loadout UI allows you to customize the abilities, weapons, and for you understading... I'll call these empowering buffs. 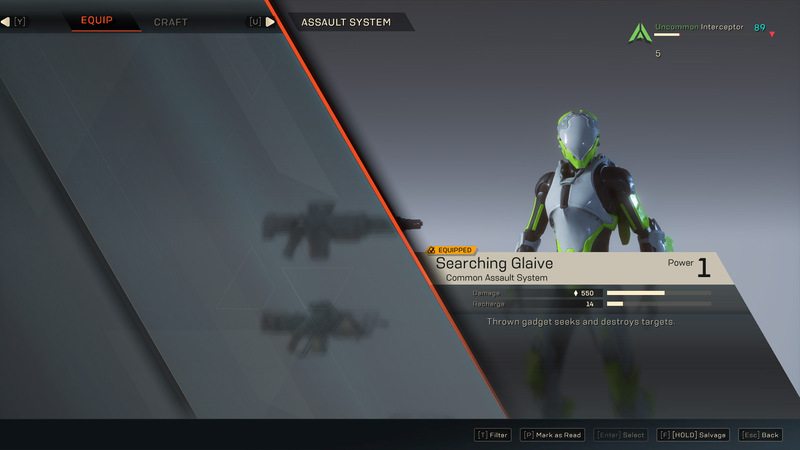 The Open Demo only had one Assault System item and crafting was disabled. 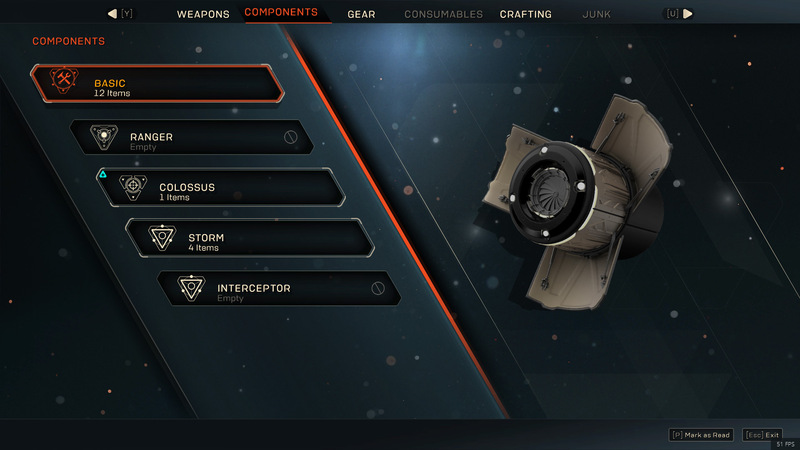 The Interceptor, for example, has a Searching Glaive which says "thrown gadget seeks and destroys targets." This is probably one of the abilities. The Ranger stores grenades in this slot, instead. So far javelins can use two different weapons, but you can choose or switch the current weapon with any you have looted. You can also salvage weapons you don't need, or craft new weapons. 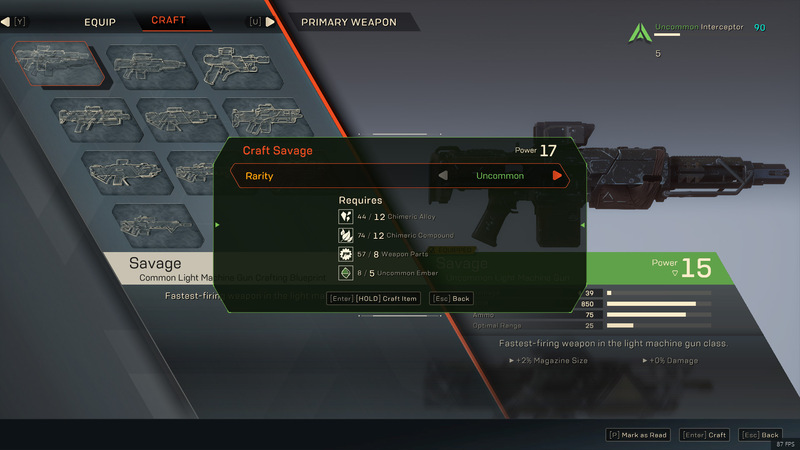 Crafting is enabled, and there is some depth here where you can upgrade crafted weapons into uncommon, rare, or epic from materials you collect in Expeditions or Freeplay. Some of these are looted from plants or mineral nodes found via Freeplay mode's exploration in the open world or caves. The Open Demo had 10 blueprints, but I assume there might be opportunities to add new blueprints for more types of weapons. Among the blueprints are: Light Machine Guns, Heavy Pistols, Shotguns, Marksman Rifle, Assault Rifle, Sniper Rifle, and Machine Pistol. 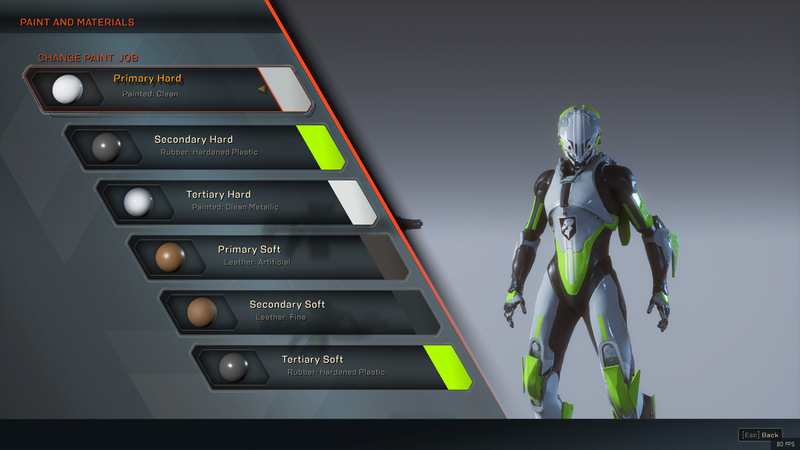 The variety of weapon qualities range from: Common (white), Uncommon (Green), Rare (Blue), or Epic (Purple). Javelins can have up to 6 components that can be compared with Talents. 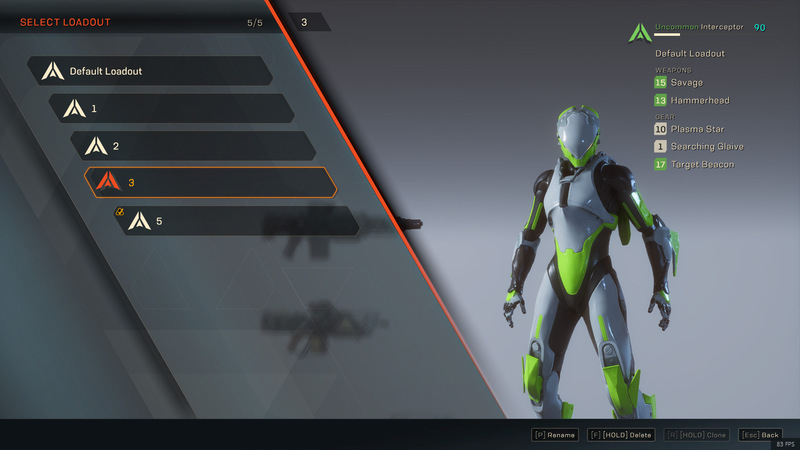 Instead of a Talent Tree, you can customize your javelin with Talents you loot, and swap them at will. This sounds pretty good. However, these are unlocked at different levels. In the Open Demo, you unlock at level 12, 14, 16, 22, 24, and 30. 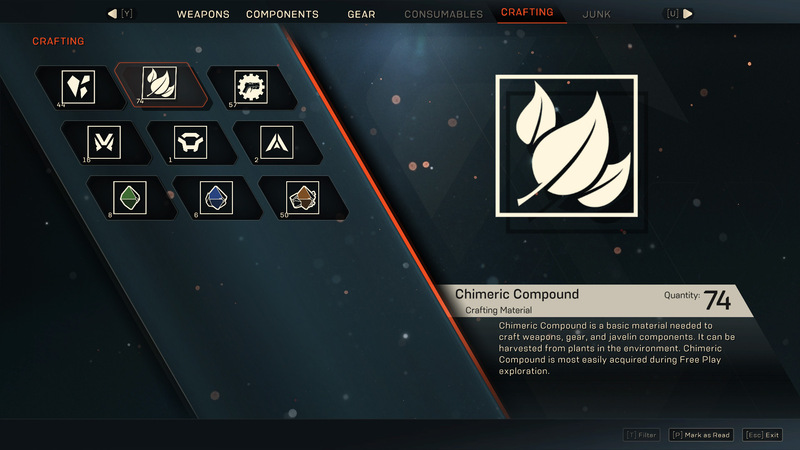 When you click the Component, it opens another UI where you can swap from a list of components you have looted or even Craft a new one. Crafting was disabled in the Open Demo. Like with weapons there are different qualities of Components: Common, Uncommon, Rare, and Epic. Here I discovered "Ultimate Inscription" which augments the javelin Ultimate gear and increases damage by 5%. Another one named Heat Sink allows you to increase the amount of time you are airborne before the engine overheats. 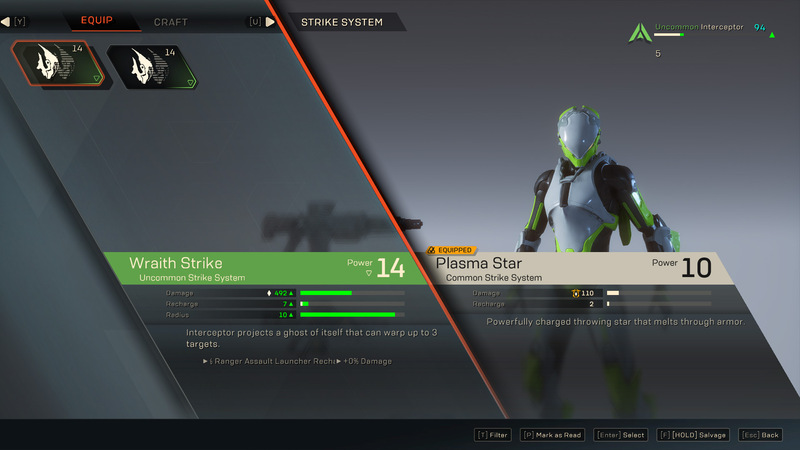 This system seems to customize your melee damage. I am assuming here. Whether different animations, or extra abilities, attacks, moves, etc. while the melee takes effect. 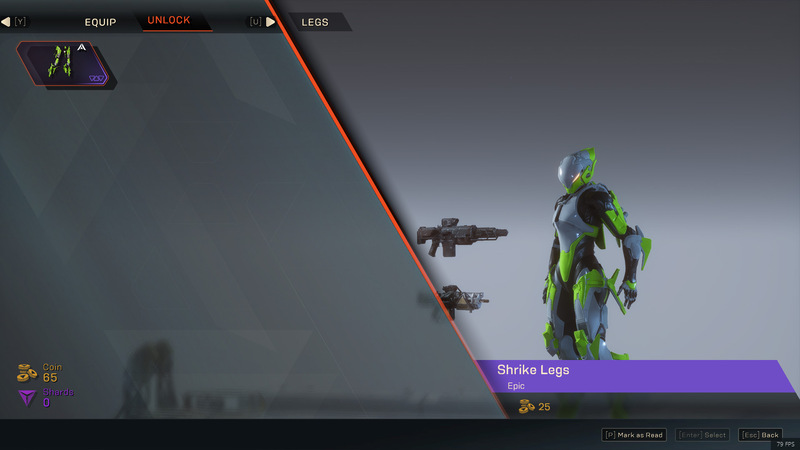 My Interceptor had "Wraith Strike" which projects a ghost of itself that can warp up to 3 targets. The Plasma Star: powerfully charged throwing star that melts through armor. The Support System seems to increase damage and add extra % ammo which means components you loot or craft can affect your gun weapons. The Open Demo only had one, but I assume there will be a variety of affixes to empower your gun weapons. 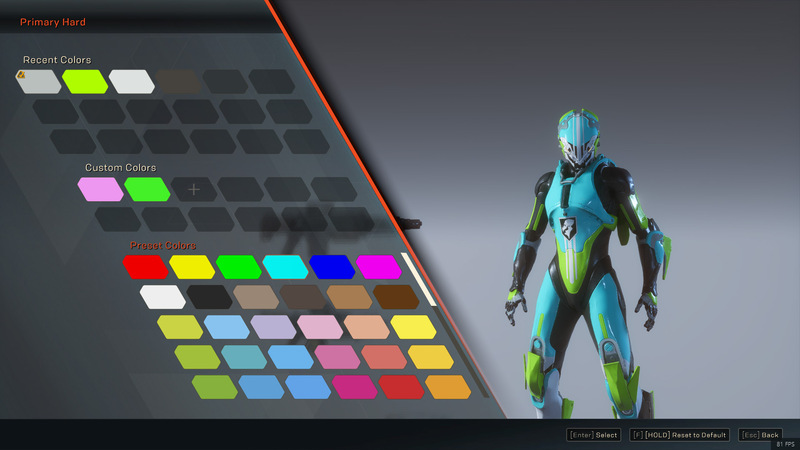 The Apperance Tab allows you to customize your Helmet, Chest, Arms, Legs, Vinyls, Wear State, Animations (emotes), and Paint (color, texture, material, patterns). 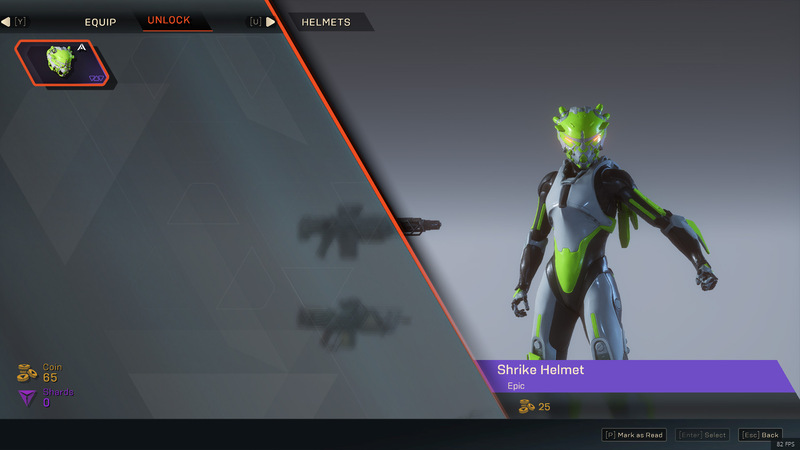 Players can change the 3D model of the helmet, chest, arms, or legs. In the Open Demo there was only the default one, and 1 Unlock variety -- which you buy with Coin or Shards (or maybe a combination of both). This is what some streamers out there got worried about due to microtransactions. 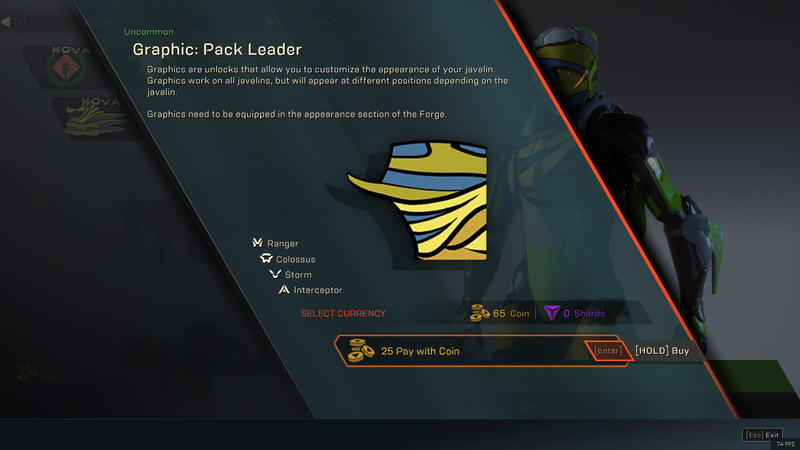 However, I have a feeling Coin is earned through Expedition rewards. I recall having 125 Coin in the Demo. I spent most of it and only had 45 Coin left. Later I had 65 Coin. That extra 20 came from somewhere. Meaning Expeditions possibly reward a small amount of gold. The Open Demo only showed 4 Vinyls. 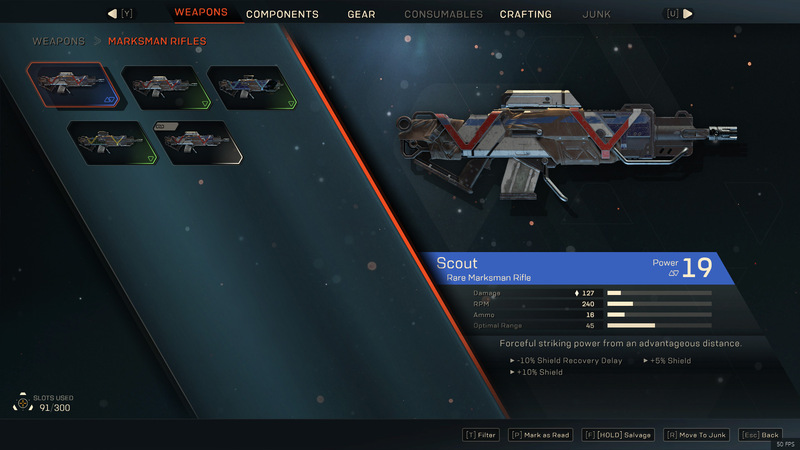 The last image shows the purchase UI. The Wear State allows you to choose whether the entire javelin looks brand new, dirty, old (chipped paint), standard, or clean. There are default animations (aka Emotes), but you can unlock more via Coin and/or Shards. The videos show some of the emotes available in the Open Demo. You can pick a Victory Pose which is shown at the end of an Expedition or Stronghold match. An arrival animation -- when the match starts. Or pick any 3 emotes (from a large list of owned emotes) for your loadout. 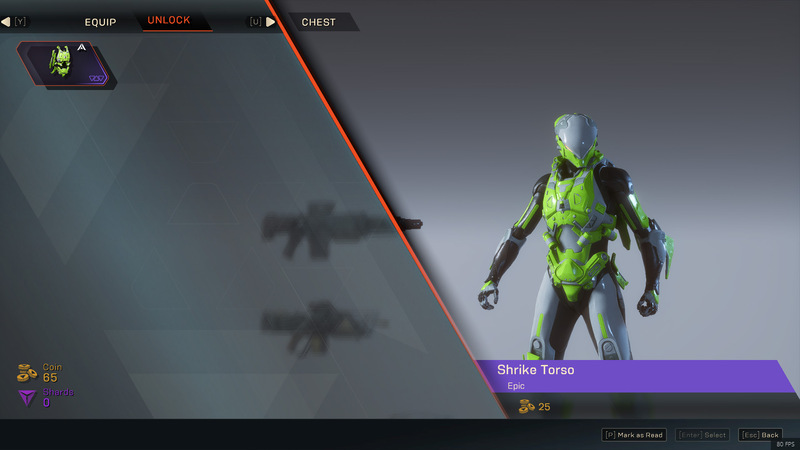 This one is the creme of customizations in Anthem. 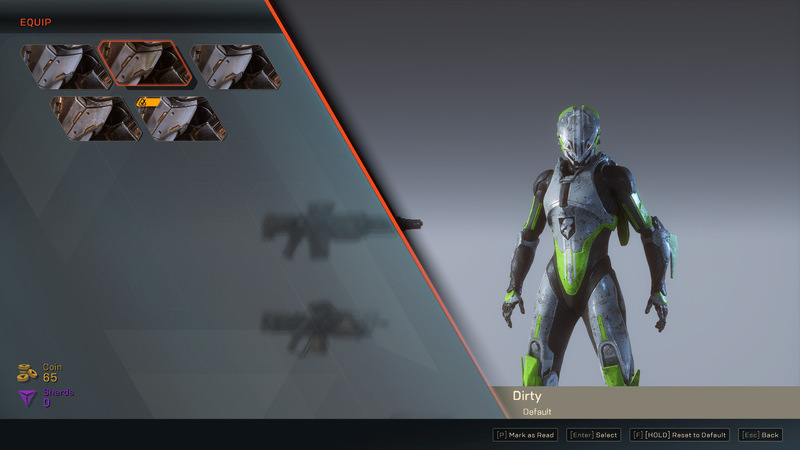 You can change the Paint job in different areas of the javelin armor set: Primary Hard, Secondary Hard, Tertiary Hard, Primary Soft, Secondary Soft, and Tertiary Soft. For each of those mentioned, you can either change the material (texture, pattern) and the color. There are preset colors to choose from, but you can also create up to 12 custom colors from the Color Picker Wheel. The wheel even shows you the RGB values from 0 to 240. The Vault is what players are used to call "Bank." Except every time you loot something from the ground or from an Expedition/Stromhold reward, it is auto-added to The Vault. Better yet, it is organized. 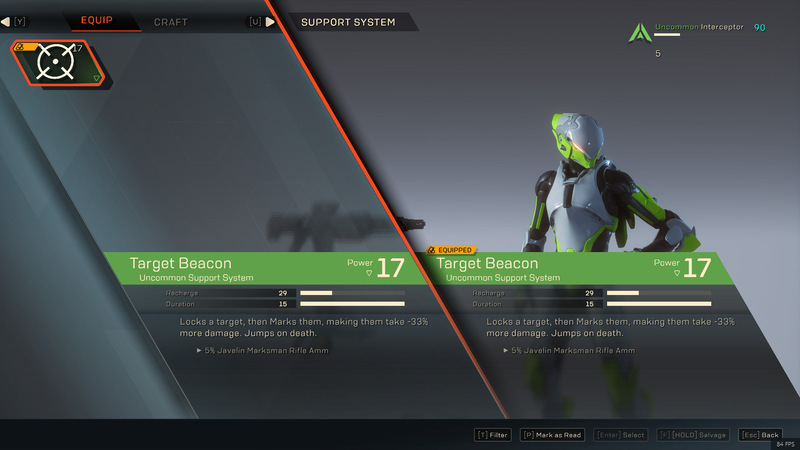 I would like to see this level of organization in the loadout's weapon UI at the Forge. There weapons are all mixed up together. The Vault has them by type of weapon: Heavy Pistols, Shotguns, Assault Rifles, Marksman Rifles, Machine Pistols, Light Machine Guns, and Sniper Rifles. 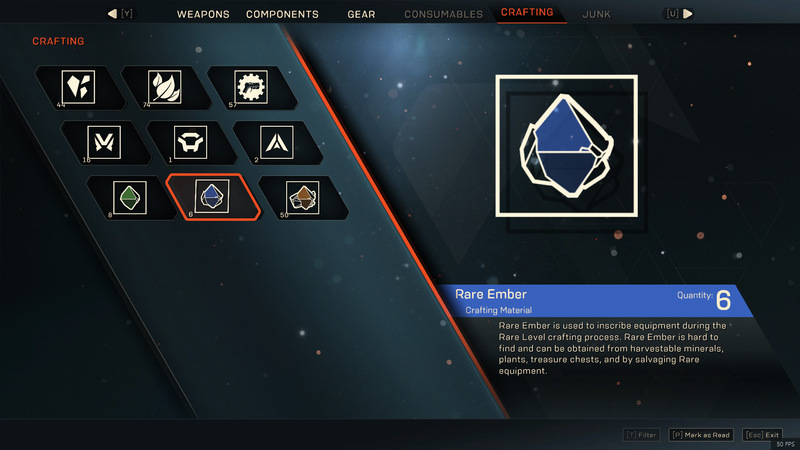 There are 6 Tabs in The Vault: Weapons, Components, Gear, Consumables, Crafting, and Junk. Here is the huge bonus: the entire vault has 300 slots. 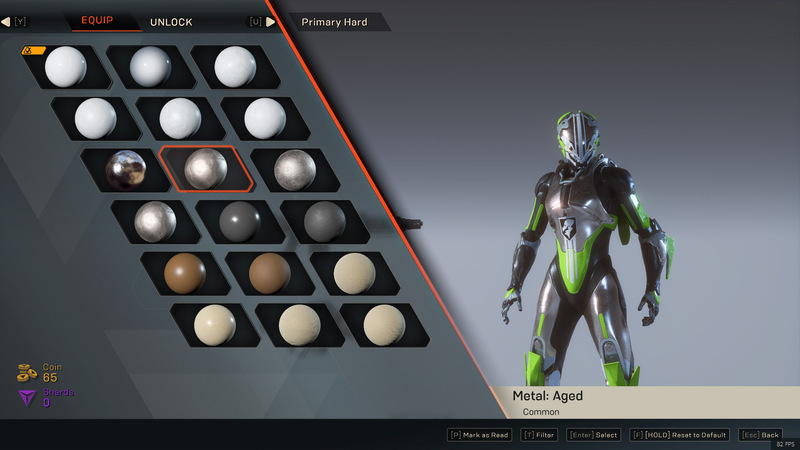 Forge: Javelin Customization. Played as Colossus but ran into a problem when I picked two Snipe rifles unknowingly. Resulted in no ammo issues most of the game. 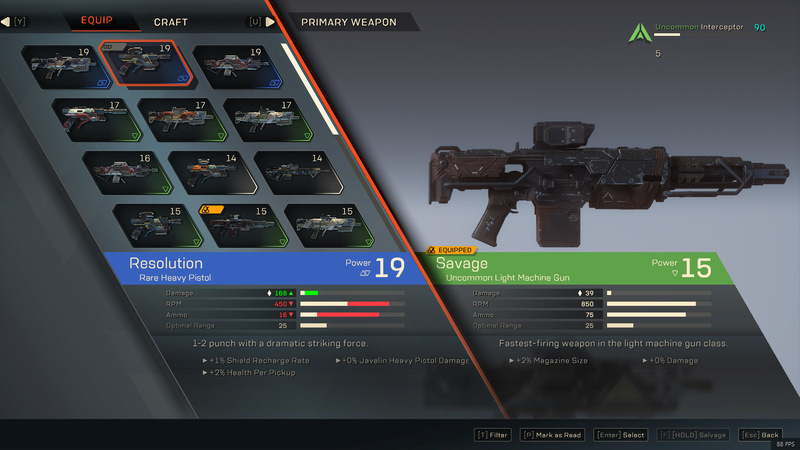 The Forge should organize weapons by type, like The Vault does. But yea, first timer here. Looked at the stats, and not at the weapon type. In this video I played as a Storm Javelin, and I loved it. Except for the server disconnections. In this video, I played as a Interceptor Javelin. Super fun playing as a ninja, and noticed the best weapons are Light Machine Gun and Marksman Rifle in terms of lots of ammo. In this video, I played as a Ranger javelin. It feels good, but die too often. Doesn't have the agility of the Storm and Interceptor. His jet pack seems to get overheat faster when hovering. 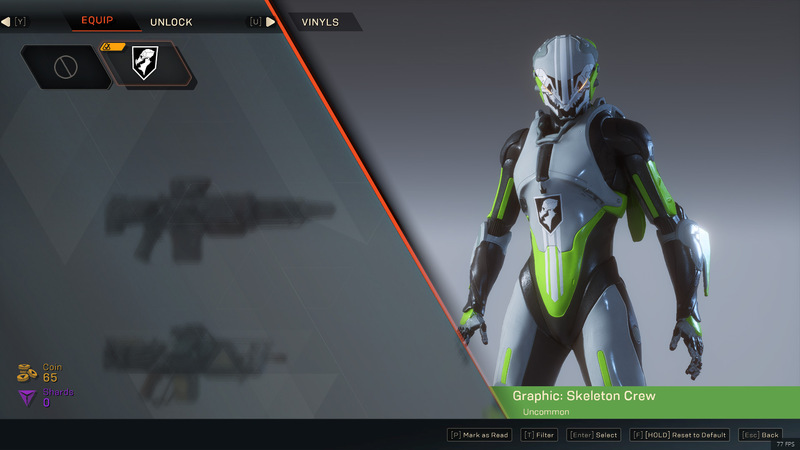 I still think that Anthem isn’t a World of Warcraft or Diablo III killer. It has many game design issues. Some might be fixed over time if the developers are willing to listen to fan feedback, but other issues are part of the core design. The engine. For example, I played in Freeplay mode and explored the zone. As soon as I entered a building or a cave, I would be slapped with a loading screen (with no warning: no portal swirl animation). This is what made me call Anthem in not so eloquent terms… Hellgate: London. 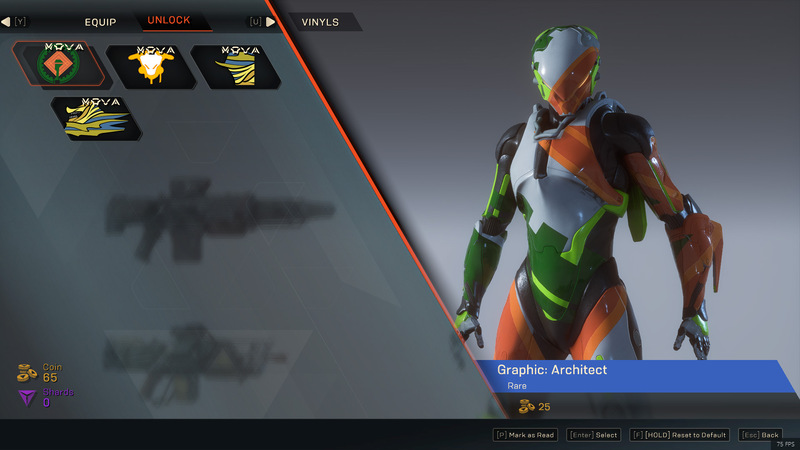 To understand how bad the Anthem core design is I would have to make a comparison with World of Warcraft. Let’s say you are in Orgrimmar instead of Anthem’s Fort Tarsis (city). 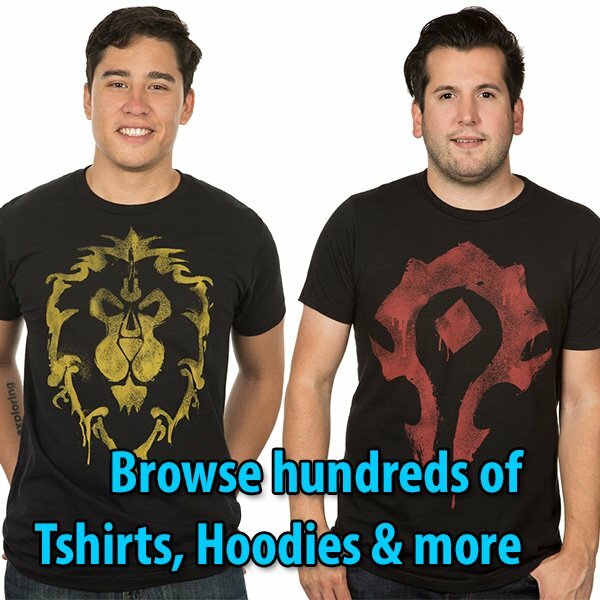 How would you feel to be the only player in Orgrimmar? How would it feel not been able to type and no General or Trade chat? 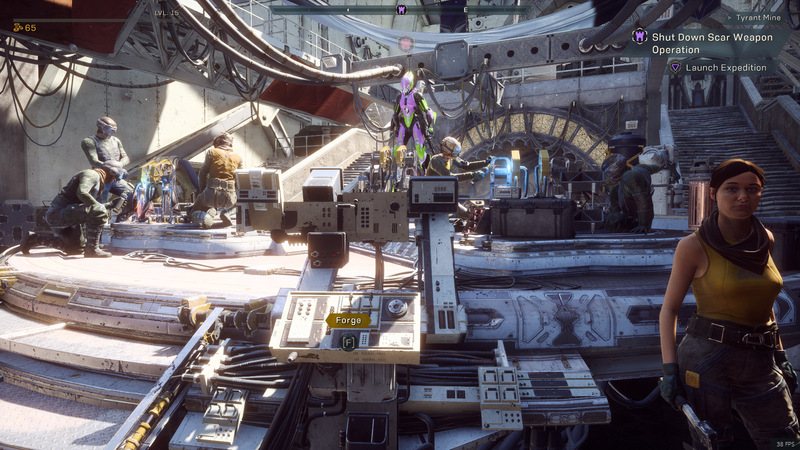 Only way of communication in Anthem is voice chat (haven’t heard anyone in the Open Demo by the way). Let’s say you are in Orgrimmar, and wish to go visit the nearby cave to the east of Orgrimmar… Skull Rock. The first thing that would happen if World of Warcraft was Anthem is that there is no Gates of Orgrimmar. Orgrimmar is a mini-instanced city. You can only leave the city by mounting your Wyvern mount. So you mount the Wyvern mount, and that opens the game mode UI: Freeplay, Dungeon, or Scenario. Ok, I need to go to Skull Rock, so I select Freeplay — which opens a loading screen that lasts approximately 70+ seconds. You heard it correctly. That’s no typo. I timed it from my first video above. Upon entering the “vast open world” in Durotar, I fly the skies of Durotar in hopes to reach the Skull Rock cave to explore for some mineral nodes, or maybe some spooky warlocks to kill and loot. But… in exactly 20 seconds, your wyvern plummets from the sky onto the ground below… because the wyvern got tired. The wyvern then can only run while it rests its wings. Fly another 20 seconds, and rinse and repeat. Finally, you crawl your way to the Skull Rock cave. As you enter the cave… you get slapped with a loading screen as if you had entered a dungeon. Just there was no portal swirl animation to inform you there was a dungeon there. The loading screen only took 13 seconds, though. Now imagine that every world quest, every cave, and every building had a loading screen. That’s Anthem. That’s what I call the Hellgate: London curse. There is no real vast open world when you are limited by loading screens. Blizzard Entertainment took the time to program the engine in such a way that transitions are seamless in the open world. The only time you see a loading screen in World of Warcraft is entering a scenario, dungeon, or raid; or using your Hearthstone; or taking the boat or zeppelin to another continent. If you wish to explore the open world (or Freeplay, as Anthem calls it), you can fly from the top of Moonglade down to the tail of Tanaris. You can explore every cave as well, uninterrupted in Kalimdor, or any other continent. Not only that abomination of being pulled away from “the vast open world” of Freeplay… after the “Expedition Complete” I had to endure a “Recording victories” progress bar with a static screen — which lasted 28 seconds, plus some medals, XP expedition feats, and such. So it wasn’t even a freeplay mode where I can explore the world for as long as I wish. The exploration was timed to 28 minutes as if it was a Expedition dungeon. 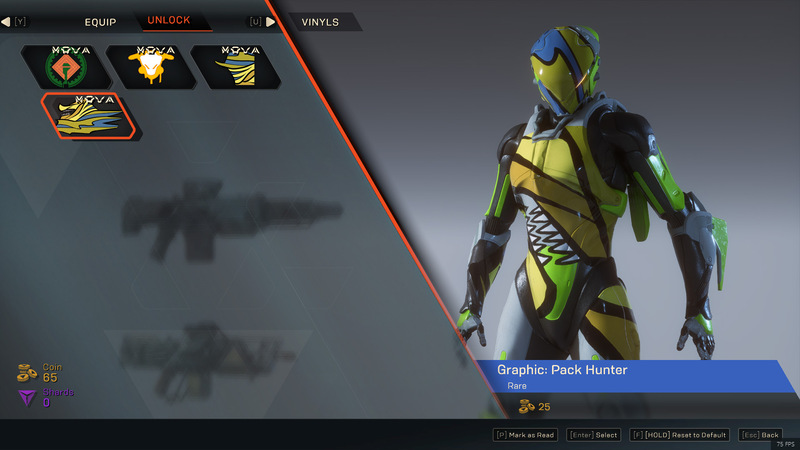 I want to play a shooter full of action, but one that’s a true “vast open world” game as Bioware flaunted in the Anthem announcement trailer. This is not one. Destiny 2 does a far better job where I can explore the entire Nessus, or Io map. There are no loading screens while you are in any of those Destiny 2 planets. Entering adventures or patrols are seamless. All you see is a change in the ambience to alert you that you have entered a patrol phase. Phasing technology. Anthem is super beautiful, it has awesome customization, but the core design is Hellgate: London. Multiple loading screens. Another fun killing factor: death. Some strongholds are so packed with snipers and gigantic turret towers it is super difficult to stay alive. Once you are death, prepare to have the Javelin Malfunctioned “Critical Failure” message on your screen for long periods of time until your team either notices, or clears the area around you. I spent 10 minutes death without a resurrection. 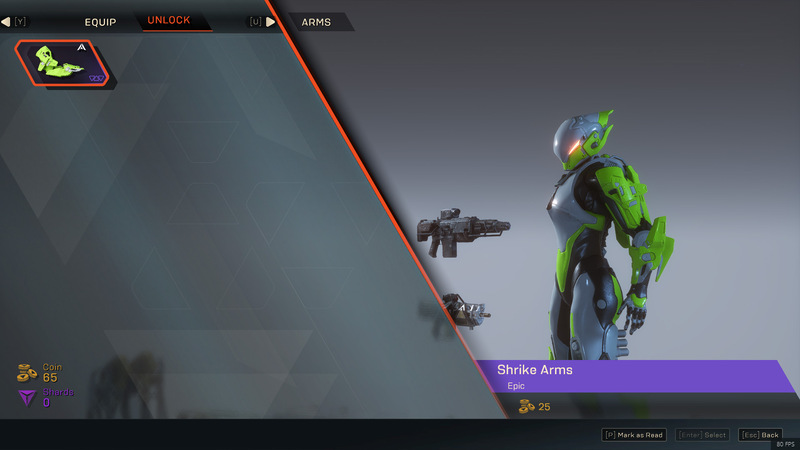 22 days after I wrote my review, AngryJoe (not a Blizzplanet team member) shared a 50-minute video reviewing Anthem after spending 70 hours of gameplay, and reaching end-game.